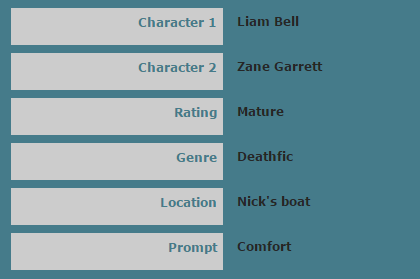 Tags: fanfiction, writing, yup can we have these? Ages ago, I made a prompt-generating script for the Sherlock fandom, and it produced some incredibly hilarious results, as well as some very awesome legitimate fics. I figured it might be fun to retool the script for the Cut & Run fandom (and subsequent/related properties, including all things Sidewinder, Warrior’s Cross, etc). You can use this if you’re stuck and simply want a random genre/prompt/etc, or go all-in and write a story using every single variable it spits out. The only things it won’t do is generate things like explicit kidfic or anything of that nature. Pretty much any pairing of characters and any location is fair game. If you have any suggestions for characters, prompts, locations, etc, that you think I should include hit up my ask box! And now all I can imagine is everyone gathered on the Fiddler to mourn Ty. THANKS PROMPTER. YOU CAN GO TO HELL. I can 1000% guarantee that someone has flailed and gushed and swooned over at least one of your fics because it spoke to something in them. You have connected with more people than you know and you should be completely proud of yourselves. Omg, I loved that new fanfic of yours so much! I hope so much there will be a sequel!